The Carbon Sequestration Leadership Forum (CSLF) held its 6th Ministerial Meeting in Riyadh, Saudi Arabia recently. The conference offered considerable opportunity for governments and companies to showcase their achievements in carbon capture and storage (CCS) and to highlight areas in which research and development was proceeding. Given the location, Saudi Aramco was there in force and they also offered the opportunity for a number of participants to visit their headquarters in Dhahran and get an even deeper look at how the company was looking at the CO2 issue and the use of CCS. As there isn’t a carbon pricing system operating in Saudi Arabia, the company is heavily focussed on using CO2 for Enhanced Oil Recovery (EOR), but this is at least driving research and development on CO2 separation, purification and transport with a view to further lowering the cost and improving the efficiency of these key steps in the CCS value chain. 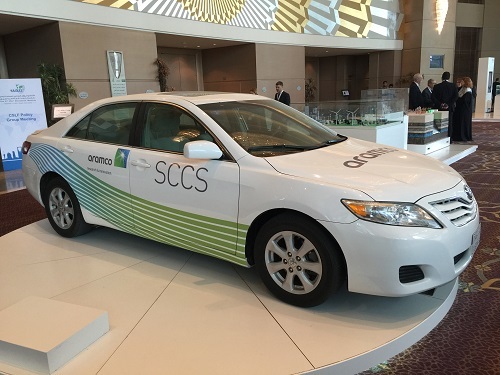 To this end, Saudi Aramco is doing some intriguing work on small scale carbon capture, which was demonstrated in both Riyadh and Dhahran by their display featuring a saloon car with on-board carbon capture. The vehicle captures about thirty percent of the carbon dioxide in the exhaust, using a solvent process. The CO2 is then recovered from the solvent, compressed and stored as a supercritical liquid in a small cylinder, all within the vehicle itself. The carbon dioxide can then be discharged when the car is filled with fuel as part of the normal service offered at a (future) gasoline station. The fuel supplier would then handle long term geological storage of the carbon dioxide or may have outlets where it can be profitably used (e.g. as a feedstock for manufacture of more fuel, but with the caveat that a considerable amount of energy will be required for such a step). The vehicle is a 2nd generation prototype, with the carbon capture equipment occupying about half the boot space. But this is a huge step forward compared to their first generation attempt where the equipment sat on a trailer pulled by the car. Further enhancements are planned. The current system is an active one, in that it draws energy from the vehicle to operate the equipment, resulting in an efficiency penalty of about 5-10% for the vehicle as a whole. Future thinking includes a more passive system, which could see carbon dioxide absorbed into a chemical matrix such as in a regular catalytic convertor. However, some energy input would presumably be required at some point to release this for subsequent use or storage. Whether this ends up as a viable domestic vehicle solution is not entirely the point at this stage. One aspiration that the demonstration alluded to was its use in Heavy Goods Vehicles (HGV) which travel long distances with large loads and where battery technology may not be feasible. Other applications could be imagined, such as on board ships. More importantly, the underlying development of smaller and cheaper carbon capture technology offers real hope for long term management of emissions. 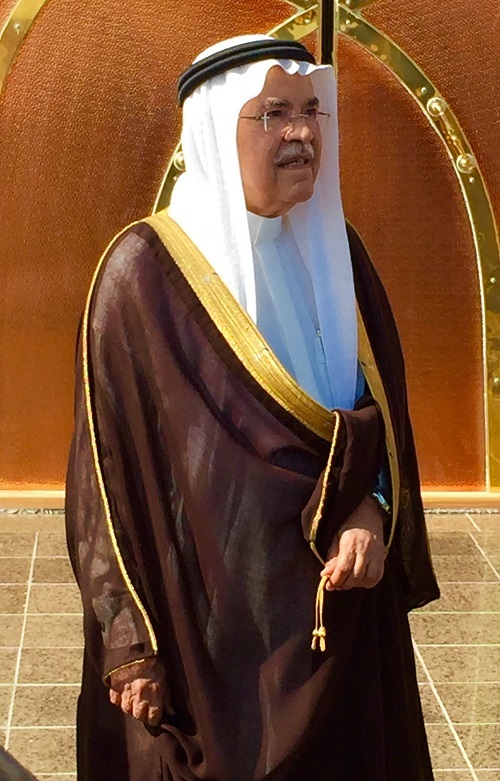 It was also clear that this work and the other efforts being made by Saudi Aramco on CCS and EOR have very high level support in the country; the Saudi Minister of Petroleum and Mineral Resources, Ali Al-Naimi, spent two full days both at the conference and escorting the smaller group to Dhahran.